The newest class of drugs that are used to treat the inflammation that is caused by inflammatory bowel disease (IBD) are called biologics. However, this is a very broad range of medications, and they don't all work the same way or are even administered in the same way. Some are approved to treat just one form of IBD, while others are used to treat both Crohn's disease and ulcerative colitis. Because biologic drugs modify the immune system in various ways (partly the reason why they work for IBD), people taking them could be prone to getting some types of infections. It's important, therefore to take steps to make sure that protections are in place to prevent infections. People with IBD should receive vaccinations, ideally before starting a biologic, but many immunizations can also be given while taking a biologic. How do physicians choose which biologic agent to recommend to a patient? There are a variety of differences between these drugs, and many factors are taken into consideration. This can include efficacy (which differs based on disease type and stage), pricing, and insurance coverage, among other factors. Physicians will need to take all of these aspects under consideration, and more, when making a recommendation to a patient for a biologic medication. Below is a look at a few of the elements of several types of biologic medications. Patients and physicians will want to weigh all these factors and others before making a decision. Cimzia (certolizumab pegol) is a tumor necrosis factor (TNF) blocker that was approved in 2008 to treat Crohn's disease. In 2009 it was approved to treat rheumatoid arthritis, and for psoriatic arthritis and ankylosing spondylitis in 2013. Cimzia is usually given by injection with a prefilled syringe at home. Cimzia is given with two injections, which are first administered in a loading dose at weeks 0, 2, and 4. After that, the two injections are given every 4 weeks. Another form of Cimzia is a powder that is mixed and then injected at a doctor's office. Side effects that occur most commonly with this drug are upper respiratory tract infections (like a cold), viral infections (like the flu), rashes, and urinary tract infections. Entyvio (vedolizumab), which was approved in May 2014, is a gut-homing α4β7 integrin antagonist. It is thought to work by binding to α4β7 integrin, which prevents the integrin from causing inflammation. Entyvio is approved for use in adults who have Crohn's disease or ulcerative colitis. Entyvio is always given by infusion, either in a doctor's office, at a hospital, or in an infusion center. The loading schedule for Entyvio is 3 infusions at weeks 0, 2, and then 6. After that, infusions are given about every 8 weeks. Some of the potential side effects include a cold, upper respiratory tract infection (the flu, bronchitis), headache, joint pains, nausea, fever, fatigue, cough, back pain, rash, itching, sinus infection, throat pain, and extremity pain. Humira (adalimumab) is another monoclonal antibody and TNF inhibitor that is used to treat people with IBD. It is approved for adults and children over the age of 6 that have ulcerative colitis or Crohn's disease. Humira was initially approved in 2002, and expanded for use in Crohn's disease in 2007 and ulcerative colitis in 2012. Humira can be given at home through an injection. Patients are trained on how to give themselves the injection (or it could be done with help from a family member or friend). Some people with Humira may have what's called an injection site reaction, which is swelling, pain, itching or redness at the place where the drug is injected. This can usually be treated at home with ice or antihistamine medications (changing injection sites every week also helps). The first biologic therapy approved for use in people with IBD is Remicade (infliximab), which was approved in 1998. Remicade is a monoclonal antibody which is a TNF inhibitor and is given to patients through an IV. 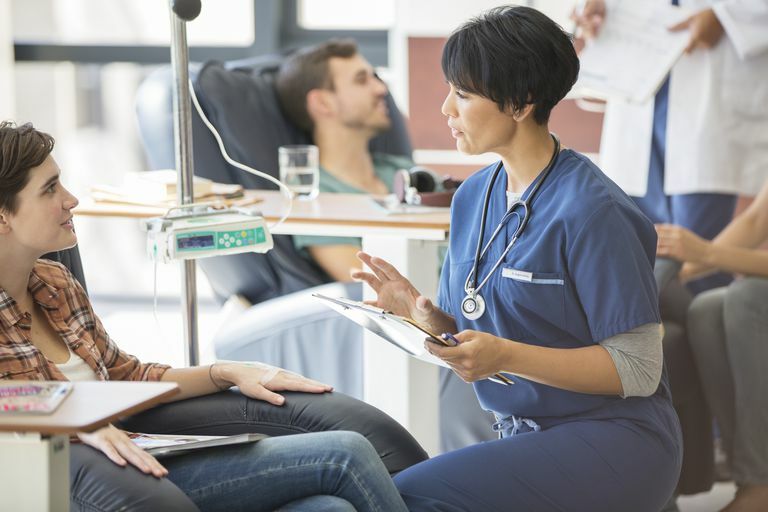 This could be done in a doctor's office, but more often occurs in an infusion center, which are specialized facilities designed to administer medications by IV. Remicade could be used to treat Crohn's disease or ulcerative colitis, and it also approved for kids as young as 6, in certain circumstances. Remicade is thought to work in people with IBD because it inhibits TNF, which is a substance that creates inflammation in the body. Simponi (golimumab) is a TNF inhibitor that's approved for treating ulcerative colitis. Simponi was approved first in 2009 to treat rheumatoid arthritis, psoriatic arthritis, and ankylosing spondylitis. In 2013 it was approved to treat ulcerative colitis. Ankylosing spondylitis is a condition that can be associated with ulcerative colitis, which means that this medication could be used to treat both (or either) disorder(s). Simponi is given at home, so patients are trained by a healthcare provider on how to inject themselves (either by themselves or with help). Some of the adverse reactions to Simponi are getting infections that cause illnesses like a cold, symptoms like a sore throat or laryngitis, and viral infections like the flu. Having redness, pain, and itchiness at the injection site, often treated with ice and antihistamines, is another potential adverse reaction. Stelara (ustekinumab) is a fully human monoclonal immunoglobulin antibody. It was first approved in 2008 as a treatment for plaque psoriasis and in 2016 to treat Crohn's disease. Stelara works to decrease the inflammation Crohn's disease causes by targeting interleukin (IL)-12 and IL-23, which are thought to play a role in the development of inflammation in the intestine. The first dose of Stelara is given by infusion, in an infusion center or a doctor's office. After that first infusion, Stelara can be taken at home with an injection that's given every 8 weeks. Patients can give themselves the injection after being trained by a healthcare provider. Some of the more common side effects seen in people with Crohn's disease who take Stelara include vomiting (during the first infusion), pain or redness at the injection site, itching, and infections such as a cold, a yeast infection, bronchitis, urinary tract infection, or sinus infection. Janssen Biotech, Inc. "Simponi Medication Guide." May 2013. Janssen, Inc. "Stelara (ustekinumab) Prescribing Information." Stelarainfo.com. Aug 2016. Mother To Baby. "Certolizumab Pegol (Cimzia) and Pregnancy." MotherToBaby.org. Aug 2015. Takeda Pharmaceuticals, Inc. "About Entyvio." Entyvio.com. 2015. UCB, Inc. "Cimzia (Certolizumab Pegol) Medication Guide." Cimzia.com. Apr 2016.